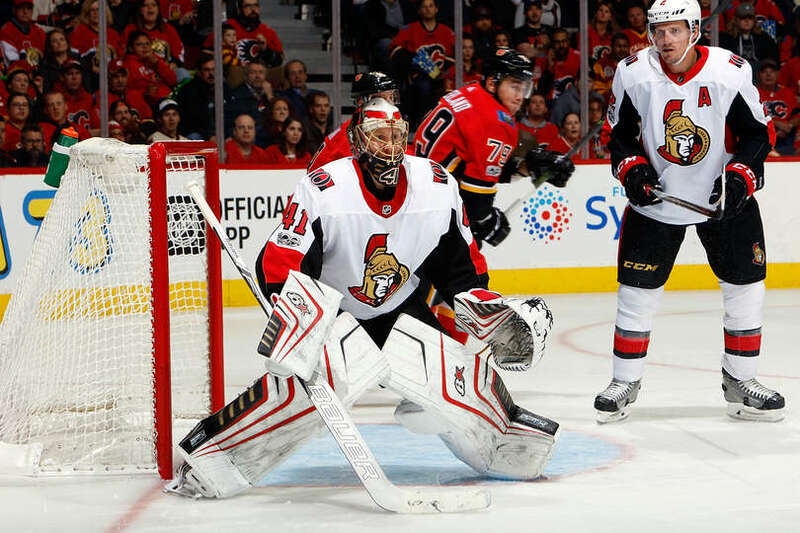 CALGARY — Craig Anderson made 25 saves, and Cody Ceci and Mark Stone each had a goal and an assist to help the Ottawa Senators to a 6-0 win against the Calgary Flames at Scotiabank Saddledome on Friday. Kyle Turris had three assists, and Derick Brassard, Mike Hoffman, Ryan Dzingel and Chris Wideman also scored for Ottawa (2-0-2), who have opened the season on a four-game point streak. The shutout is Anderson’s first of the season and 39th of his NHL career. He has a 1.65 goals-against average and .937 save percentage through four starts. Mike Smith made 17 saves for the Flames (3-2-0), who ended a three-game winning streak. Calgary has been shutout in each of its two losses this season; the Flames lost 3-0 at the Edmonton Oilers on Oct. 4 in the season opener. Jaromir Jagr played his first game in Calgary for the Flames after signing a one-year contract on Oct. 4. Ceci scored with 45 seconds remaining in the first period to put Ottawa up 1-0, and Brassard made it 2-0 at 18:43 of the second when he shot by Smith’s glove from the point. Hoffman scored on the power play 1:08 into the third period to make it 3-0. Ottawa was 0-for-20 on the power play to start the season prior to the goal, which came with Jagr in the penalty box for hooking. The Senators were 2-for-7 with the man-advantage Friday. Stone made it 4-0 at 5:18, and Dzingel finished a three-way passing play by lifting a shot over Smith’s shoulder at 7:29 to put the Senators up 5-0. Eddie Lack relieved Smith after the goal. Wideman scored on the power play to give Ottawa a 6-0 lead with 3:37 remaining. Ceci took a pass from Tom Pyatt off the rush and slipped a backhand between Smith’s legs for his second goal of the season. Michael Frolik found Matthew Tkachuk behind Ottawa’s defense, but Anderson made a pad save on Tkachuk’s backhand to keep the Senators up 3-0 at 3:08 of the third period. Off a faceoff win by Turris, Hoffman one-timed a return pass from Thomas Chabot over Smith’s glove for his first goal of the season. Jagr had four shots in 13:27 of ice time. … Senators defenseman Erik Karlsson, who is recovering from foot surgery on June 14, missed his fourth straight game to start the season. Ottawa defenseman Johnny Oduya (lower body) also missed a third straight game, but is expected to play at the Edmonton Oilers on Saturday. The Senators remained perfect on the penalty kill (12-for-12).